Whether your heritage is Irish or you just love to celebrate the phenomenon of St. Patrick's Day, you will love these stamps inspired by Irish & Celtic symbols. 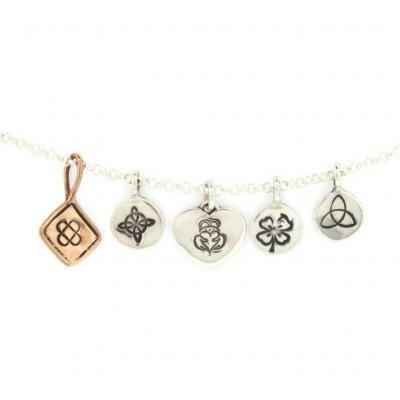 Pick one to add to one of our sterling silver charms. The Claddagh (Irish: Chladaigh) represents love, loyalty, and friendship (the hands represent friendship, the heart represents love, and the crown represents loyalty). Tradition states that a Four Leaf Clover will bring good luck. Mandalas offered the ancient Celts a way to focus, engaging their hearts and minds with the goal of becoming more keenly aware and achieving a sense of true enlightenment. Note: Trinket Charms are much thinner and light weight than the majority of our charms. The Trinket and Covey Charms do not need a jump ring to slide on most chains. The other charms will come with a jump ring to attach the charm to a necklace or bracelet. You will need to either take it to a jeweler to attach or if you have 2 needle nosed pliers, you can watch this video which will show you how to attach the charm. If you put the charm on a bracelet, it will need to be soldered on so it does not fall off. If you prefer, you can send your original necklace back to us using this form. Please fill out the form completely and include a drawing of exactly how you want your necklace or bracelet to look after the charm is added. There is a $10 charge to return the necklace or bracelet and have us add the charm and ship it back to you. We will also clean it before returning it to you so it looks as close to new as we can get it! This item is wrapped in our signature lavender and rosebud packaging. So whether it is a gift for you or someone else, the surprise you get when you open the box will make you smile!